SONY is the Official Camera Partner of the Invisible Photographer Asia Awards 2018. Our award winners will receive high performance Alpha and RX cameras from SONY. 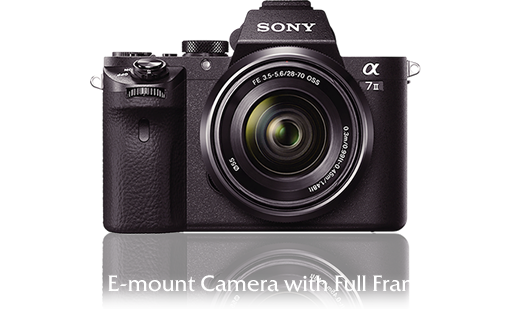 The camera offers outstanding image quality in a compact size and light build, and it carries on the traditions of the α7 series, which includes the world’s smallest and lightest interchangeable-lens full-frame camera. A 24.3 effective megapixel 35 mm full-frame Exmor® CMOS sensor moves along five axes to compensate for camera shake, providing optical image stabilisation equivalent to up to 4.5 steps faster shutter speed of correction for still images. Shooting sharp handheld stills and video is now possible under conditions that may have required a tripod in the past. In this and other scenarios, users can enjoy beautifully rendered images from the full-frame sensor with the convenience of image stabilisation. In-camera image stabilisation also offers sharper images for those using A-mount lenses on an optional lens adapter. The α7 II is also capable of speedy, accurate autofocus due to a wide AF coverage with the employment of a 117-point focal plane phase-detection AF sensor (in combination with a 25-point contrast detection AF points).117-point focal plane phase-detection AF sensor and 25 contrast detection AF points are placed over a wide area of the screen, making use of the superb tracking capabilities of the phase detection AF and therefore enabling clear capture of moving subjects that might otherwise evade focus. The α6500 features the unrivaled 4D FOCUS™ system, which can lock focus on a subject in as little as 0.05 seconds with 425 phase detection AF points that are densely positioned over nearly the entire image area. The α6500 can shoot images at up to 11 frames per second with continuous autofocus and exposure tracking, and up to 8 frames per second in a live-view shooting mode that makes it easy to track fast moving subjects. At the same time, it combines all of the benefits of an electronic viewfinder with the immediacy of an optical viewfinder. The camera can shoot at these high speeds for up to 307 frames1 With “Hi” continuous shooting mode and “Fine” image quality. thanks to its expanded buffer, which, along with the fast response speeds described above, are all achieved with the support of a new front-end LSI chip that has been added to the camera. This new front-end LSI also serves to enhance both still and video image quality. 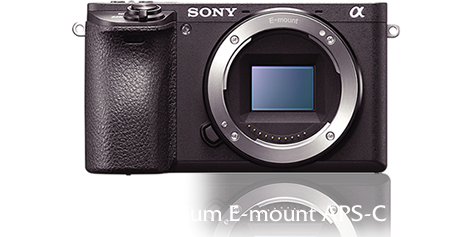 Additionally, the α6500 features Sony’s acclaimed in-camera 5-axis optical image stabilisation, making it the first Sony APS-C sensor camera to offer all of the benefits of advanced in-body stabilisation, including a shutter speed advantage of approximately 5 steps2. It also offers touchscreen AF capabilities for focus point selection and adjustment. The α6500 also offers internal 4K movie recording, as it can shoot 4K (3840 x 2160p) video in the popular Super 35mm format on the full width of the image sensor. When shooting in this format, the camera uses full pixel readout without pixel binning to collect 6K of information – approximately 2.4x3(20MP equivalent) as many pixels as 4K UHD, and then oversamples the information to produce high quality 4K footage with exceptional detail and depth. The exciting camera brings a new level of AF performance and speed to today’s compact camera market. It is equipped with a Fast Hybrid AF system with an AF acquisition1 at 0.05 seconds4, and 315 AF points on sensor1 covering approximately 65 per cent of the frame. The camera can further shoot continuously at speeds of up to 24 fps5 – the world’s fastest for a compact camera1 – at full 20.1MP (approx. effective) resolution with AF/AE tracking for up to 150 continuous shots6. 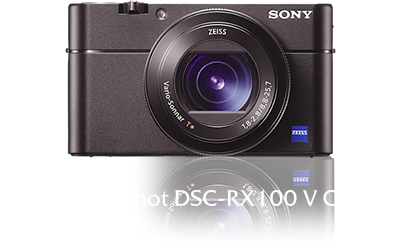 The RX100 V is equipped with a newly developed 1.0-type stacked Exmor RS™ CMOS sensor with a DRAM chip, a ZEISS® Vario-Sonnar T* 24-70 mm F1.8 to 2.8 large aperture lens, and an enhanced image processing system with a new front-end LSI chip that maximises processing speed, expands the memory buffer and optimises image quality, in particular at high ISO settings. The camera also features 4K video recording with full pixel readout and no pixel binning , super slow motion recording at up to 960fps with extended recording time and more. 1 With "Hi" continuous shooting mode and "Fine” image quality. 2Based on CIPA standard. Pitch/yaw shake only. With Sonnar T* FE 55mm F1.8 ZA lens mounted. Long exposure NR off. 3In 25p recording. 4CIPA standard, internal measurement, at f=8.8mm (wide telephoto), EV4.7, Program Auto, Focus mode: AF-A, AF area: Wide. 5With "Continuous shooting mode: Hi". 6With "Continuous shooting mode: Hi" and "Image quality: Fine". 735mm equivalent. 8Continuous recording is available for approx. 5 minutes. The duration available for the shooting may change according to shooting conditions. 9Silent shooting can be activated via "Shutter type: Electronic” and “Audio signals: Off”.